Confidence and trust in our Clinicians is paramount to ensure that you are satisfied at all times during your journey with us. All our team members receive on-going training to ensure they follow best practice and deliver high standards of care. We continually update our skills and techniques so that every visit to our surgery is as relaxed and comfortable as possible. Lorna is our most local team member. She has been welcoming patients at the front-desk for 15 years and particularly likes to be part of a friendly and professional group. When Lorna is not on duty, she likes walking in the countryside with her dog Bruce, gardening, reading and spending time with family and friends. Having worked with the Principal Dentist at a different location in the past, Suzanne joined the team in 2015. Her experience working with the public is varied over many years and includes roles ranging from public relations, front-desk, administration and concept development. She very much enjoys her role as Front-Desk at Honeycomb Dental Clinic, meeting and greeting patients and being part of progressive and friendly team. Further on, Melinda then trained to become a fully qualified Dental Nurse Assessor; and after a period travelling around the Southwest training, assessing and qualifying new dental nurses, decided to return to practice life by joining us at Honeycomb Dental Clinic. At HDC you will find her smiling either on the Front-Desk or readily available nursing in surgery. Charlotte trained as a Dental Hygienist and Therapist at Cardiff University Dental School and qualified in 2009. Our valued Hygienist/Therapist moved to Bristol from Exeter in 2015. Having joined Honeycomb Dental Clinic in the same year, Charlotte’s dedication has already built a great reputation with her patients. Being a Therapist, Charlotte can provide fillings for patients as well as treating gum disease. “I particularly enjoy working with children and helping people feel at ease during dental treatment”. During her spare time, Charlotte enjoys spending time with family and friends, and keeps active by running and doing yoga. She also likes to surf in the summer when the weather is warm enough! Liz graduated from Liverpool University in 2016, studying dental hygiene and therapy. Additionally, she has a degree in pharmacology from Kings College London and has been involved in scientific research in Novartis, Switzerland and the University of Nottingham. With a strong background in biological sciences alongside an enthusiasm for treating patients, this gives her a holistic approach to patient care. Upon graduation, Lizi won 8 awards (including British Society of Dental Hygiene and Therapy Graduate Prize – Highest mark; British Association of Dental Therapist Prize – Highest mark) and is nominated for Student of the Year Award 2017. During her free time, Elizabeth likes to spend time with her friends and family in the Welsh countryside, travelling the world and swing dancing. Shortly after graduating in 2003 in Lisbon, Portugal, Miguel moved to the UK. Looking for a change and challenge in both his life and career he decided upon the city of Bristol mainly for its cultural diversity and vibrant reputation. Working for several practices in the Bristol area for 10 years has provided Miguel with vast cultural and work experience. He is now established in Winscombe as the owner and registered manager of Honeycomb Dental Clinic. Miguel’s core motivation to be a dentist is the everyday challenge of delivering high quality therapy adapted to individual’s needs of various types of characters and personalities coming into the Clinic; and the sense of accomplishment in doing so when noticing the positive impact of the end results on his patients. Miguel has a particular interest in Fixed Prosthodontics (crown and bridge work) and Endodontics (root canal therapy). In 2008, he joined 'Dentists without Borders' in Central America, providing Aid work to the local people of Nicaragua. He has travelled the world and is very curious about different cultures. He feels connected to Nature and the Environment. Our principal dentist will also get his hand on any sports challenge one can throw at him: Snowboarding; he is a Stress & Rescue certified Scuba Diver; enjoys climbing; basketball (he played in a team); he is a keen trekker; and more. Nowadays, in his free time, Miguel likes to immerse himself spending time with his family and playing alongside his young daughter. Graduating in London in 2012, Daan completed his training in the South West and subsequently moved to Bristol to begin his career as an Associate Dentist. He worked in the heart of Bristol in a flagship mixed NHS/Private practice and joined us at Honeycomb Dental Clinic in the summer of 2016. Daan was looking to find a change of scenery and a better environment to progress his career. Daan has completed a Master’s degree in Restorative and Aesthetic Dentistry from the University of Manchester. “My passion does lie with cosmetic dentistry and directly improving ones visible smile." Daan has also completed a course in short term orthodontics (braces), which allows him to straighten the alignment of our patients' front teeth. "I like to consider myself a patient, hardworking and approachable dentist who will always give the time needed to my patients and make sure they are relaxed, well understood and, most of all, leave my surgery feeling cared for and respected". "My philosophy is to treat my patients as family and instill a jovial, yet calm atmosphere into the surgery, as it inevitably leads to a more comfortable journey for everyone." In his spare time, Daan enjoys keeping fit in the gym, goes out on hikes/treks and likes to play basketball. He also enjoys traveling with the view to explore new cultures and experiences abroad. Tara graduated from the University of Bristol in 2010 and has worked in the South West since. Having enjoyed working as an associate in Bradford on Avon for the last 6 years, Tara decided to return to the Bristol area and joined Honeycomb Dental Clinic. Tara’s dental interests lie in cosmetic dentistry, with a particular focus on conservative techniques and minimally invasive dentistry. Tara holds postgraduate qualifications from the Faculty of Dental Surgery and has completed a PG Cert in Contemporary Restorative and Aesthetic Dentistry. Outside of dentistry Tara enjoys painting and drawing; and has more recently turned her hand to calligraphy. She also likes spending time with friends and family. 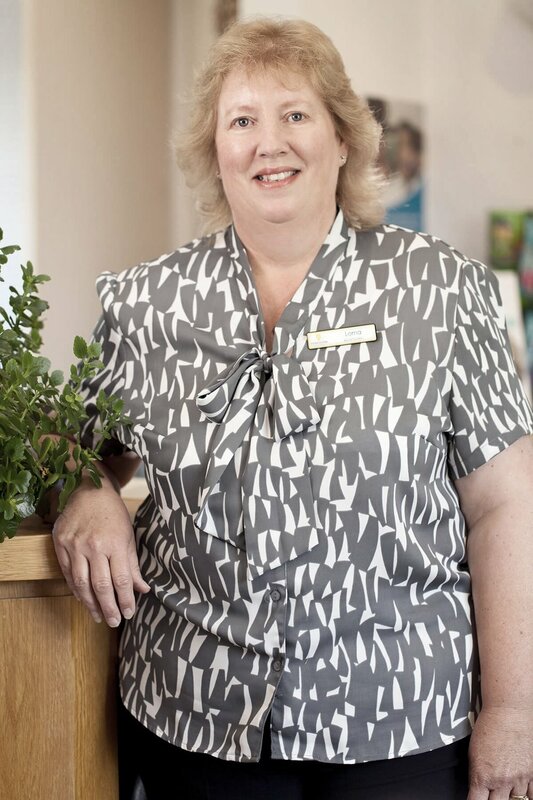 Moira trained as a medical nurse at Southmead Hospital in 1980 and after 20 years decided to change her path and embark in Dentistry, in 2001. She gained the national exam for Dental Nurses at the Bristol Dental Hospital and has worked in and around Weston-Super-Mare area, gaining valuable experience. Moira joined Honeycomb Dental Clinic in August 2016 and she soon became an invaluable member of our Team. ‘’As a dental nurse I like to be part of a team who can provide people with professional and quality care. And this is exactly what I find here, a lovely friendly place to work’. In her spare time, Moira likes to spend time with her family, play badminton and enjoys line dancing. Jessica gained the NEBDN National Diploma in Dental Nursing in 2013 after studying at Bristol Dental Hospital. Since then she has completed additional qualifications in Topical Fluoride Varnish Application, Impression Taking and Placement of Rubber Dam. She is currently studying for the NEBDN Certificate in Oral Health Education. Jessica has previously worked in both NHS and private sectors in the local area. Outside of work, Jessica enjoys making decorated cakes for family and friends. She also enjoys reading and plays the flute and saxophone. Alma has been in the dental sector for a short while now as a Trainee Nurse and is currently our Decontamination Nurse, a crucial role at keeping our instruments ‘squeaky clean’ and without which we could not function. She is our behind the scenes working bee! Alma likes to be part of the process of helping people having a wonderful smile. She likes to see patients be made confident and reassured. Alma is very home orientated. Her favourite hobby is gardening and she helps too with the Clinic’s garden. Besides that, cooking and caring for people and animals is very important for her. Very regularly she enjoys going out for walks in the surrounds of the beautiful village where she lives: Winscombe. Tina has worked within the Dental Industry for nearly 30 years. Starting as a dental nurse and receptionist, over the years Tina naturally progressed into Practice Management and Cluster Management. She worked for a corporate Dental Group in Bristol where she was looking after a small group of 3 practices over a period of 6 years. She then took up a senior role as an Area Manager for a large corporate dental company covering South and West Wales. Subsequently, Tina’s career went even further by securing an ‘Operations Manager’ role running a group of 10 Dental Practices covering all aspects of the day to day running of a company. "I'm very proud and happy to be working alongside such a professional team as we all strive to deliver high standard care and a great patient’s journey." On a personal note Tina enjoys gardening and Ceroc dancing where she trains twice weekly and enters local and regional Ceroc dancing competitions with her partner: a great way of keeping fit! To recycle all our domestic waste. To help with the segregation of our recycled waste. To keep lights and all electrical appliances switched off (not on standby) when not in use. To keep doors and windows closed when heating is Switched On. To print documents double-sided and gray scale. To encourage the Owner and Manager to keep purchasing 100% recycled paper and environmental friendly chemicals. To encourage the Owner and Manager to buy used furniture and other items, whenever possible. Whenever needed, to help the Owner and Manager in developing Environmental friendly strategies. To encourage patients to use digital medical forms (instead of paper).